Utica's Famed Chamber of "No Commerce"
Prologue: We apologize to any innocent members of the Chamber staff, and even some newer board members, but the Chamber is not easy to comprehend. Like many organizations, too much power is in the hands of too few people. In our war rooms, and as time allows, we're compiling a spreadsheet of various Community boards and staff members throughout the Mohawk Valley. There are many, too many, interconnections. The functions of the Utica chamber is one that's highly impaired. Does one want to see such a headline, but perhaps we need to help them lose their Accreditation. Sad yes, but maybe necessary, as bitter medicine (and headlines) are sometimes unavoidable! To quote a few recent departing chamber board members; "Where is the commerce in the chamber of commerce? ", "New board members are at times like sheep going off to slaughter, as the Chamber Patriarch drives the agenda", "too heavily controlled by government appointments and or non-profits" and "Most of us have full-time jobs, while others have lots of time, and law degrees!" Let us say we saw a new Utica taking shape, but old-school politics seems to be gearing up to hold us back or keep us down. A hospital district is not a downtown solution, not for our small city. We are not only committed to stopping the bulldozers, but also for bringing new faces into city and county politics. Unfortunately we must first expose the ugly underbelly of the "Utica Chamber of No Commerce"
We understand that the full membership of 600-700 businesses did not vote. The only discussion was within the Chamber's Government Affairs / Economic Development Council. They then "passed word up to" the full Board of Directors, and then they voted supposedly unanimously. We can see that Elis J Delia Chairs the Government Affairs / Economic Development Council, but we need to understand; who the others were on that committee, what was discussed and understood, number of meetings held, persons consulted with, information collected and analyzed, and what about changing board and committee membership? The group seems to have some Dynamic Changes On Their Board & Committees, so who made the important calls on their Hospital Resolution? #NoHospitalDowntown spoke to the Chamber about MVHS's concept for a downtown hospital almost two years ago. It was said the issue wasn't one for them. That's odd, why was the Utica Chamber silent on the largest concept for Utica - in the history of Utica? Perhaps since the Mohawk Valley Health System is one of the Chamber's largest members (maybe the largest! ), that played a role? Our group has about twenty years of history on the Utica Chamber, much more with the stories we've heard. We also know at their recent Annual Meeting, the Chamber spoke in favor of the downtown hospital concept. Thus their meeting tomorrow will only be to add more voices to the wrong side of the battle - just the same #NoHospitalDowntown shall continue to work to save the soul of Downtown Utica! Below we will show you that the Chamber is not a truly independent voice; beyond annual membership dues, there are many reasons they'd side with the downtown concept and the hospital. See below for what we know, and we'll be adding more as days go by. Patrick Becher, Chairman - Mr Becher's board that he must listen to, is stacked by Government Appointments. So the many small businesses (we estimate to number between 600-700) are governed - starting at the top - by the political establishment! Oh, wait until you see how the regional community boards are also stacked with those same members, time and time again. Boy do we have a HUGE war room map, where we are connecting all the Key Operatives Of Fiasco General! Daria Helmer, First Vice Chair - See below for more, but note Ms Helmer works by a company owned by a leading advocate for bulldozing downtown Utica, One Mr Larry Gilroy and the firm is to believed to have substantial business dealings with MVHS's hospitals. Brian R. Loughlin, Assistant Treasurer - We have it on good account that the Bank of Utica, for whom Mr Loughlin works, is fully committed to the downtown location. Also, a main revenue stream for the bank are "bonds", and the NYS government will be selling $300 million in bonds to fund the hospital! Pamela DelMedico Mustee, Secretary - We believe she's a resident of New Hartford and we understand that many people voting to place the hospital into downtown, don't really know downtown! How much does Ms DelMedico Mustee really know about the Columbia-Lafayette Neighborhood? Edward Barone, (Company & his title are missing?) - [Chamber Employee?] Quick check of web, looks like Edward works for Chamber. If so, is it a good idea (even allowable) for a staffer to be on the board? Thomas Bashant, President, MSi Molding Solutions Inc - [PRIVATE BUSINESS], NO LONGER ON BOARD, ask him why! Mike Bushardt, Chief Estimator, Charles A Gaetano Construction Corp - his employer would be HUGELY happy to build a new downtown after it was bulldozed; Gaetano Construction who also proudly states their a partner to MV EDGE! Mark D Foresti, Regional Vice President, Primerica - Mark is also President of Utica Rotary. #NoHospitalDowntown presented at the Utica Rotary, but afterwards there was "zero" media follow-up - in spite of interviews with media. Pictures taken, but just posted to a static Rotary Page (Thank You! ), but not to the Rotary Facebook page; Everyone, Except #NoHospitalDowntown's 1/13/17 Presentation Gets The Shout-outs. Odd that Mark gave a big hat-tip to Anthony J Picente, Oneida County Executive, as did many the other speakers and guests on their Facebook page. Oh well, maybe Debra Altdoerffer's (Vice President of Communications & Marketing for MVHS) protective husband, Jack quelled what we told was a very popular presentation? Michael B. Morrill, Owner & President, Total Solutions - [PRIVATE BUSINESS], NO LONGER ON BOARD, ask him why! Rob Shauger, Director of Sales & Development, ConfiData - [PRIVATE BUSINESS], NO LONGER ON BOARD, ask him why! The Chamber got real cozy with the hospital in 2015. 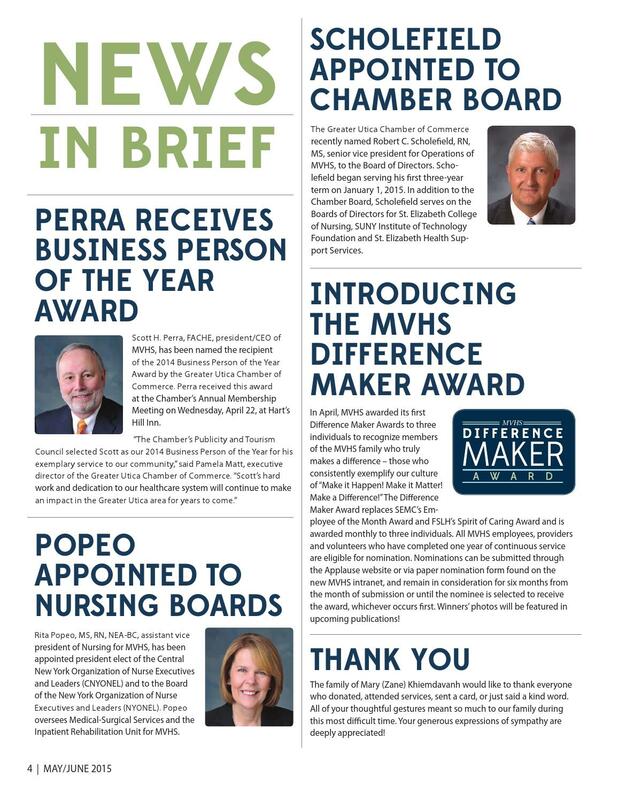 This when news was just coming-out about a new hospital, and as CEO Perra receives the Chamber's "Man Of The Year" Award, and COO Scholefield Takes 3-year Board Seat Yet, perhaps even they realized it was perhaps too cozy, as Scholefield's no longer on board.